As you enter the main entrance, you will first encounter this massive area known as the Reception Room. Only 2 families have lived in this home. Known as the Study Room, it became the favorite of the last owners, the Roths. Mrs. Roth's portrait is hanging over the fireplace. 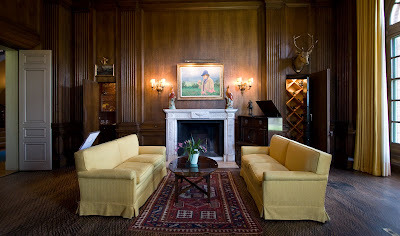 The vaults on each side of the mantel were converted into a wet bar and wine storage by the Roths. This is probably my favorite room of all...the Ballroom. 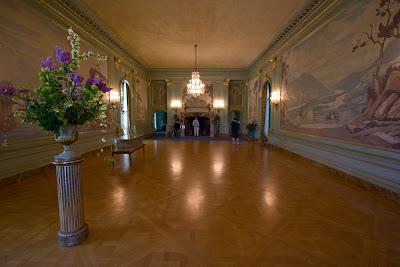 The room is 32 feet (9.75 m) wide and 70 feet (21.3 m) long. 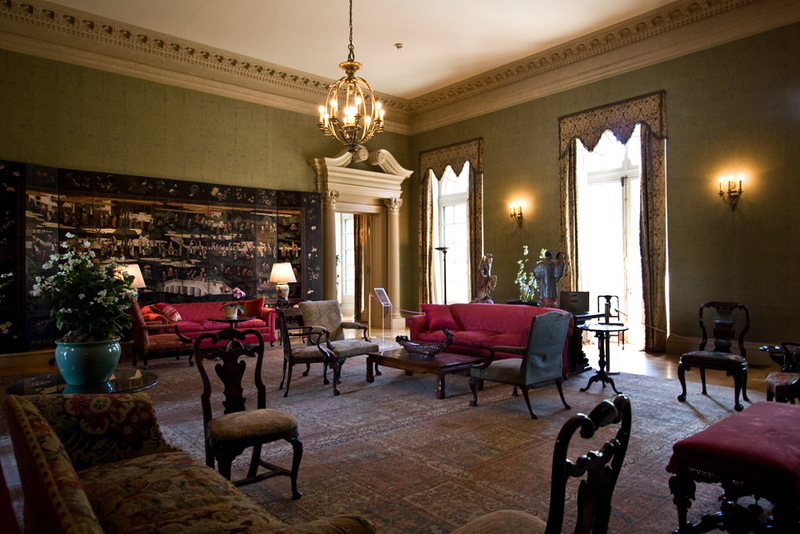 Imagine the parties held here. Elegant enough for royalty. In the back of the room is a huge fireplace. With a person standing in front of it in this photo, you can imagine its size. 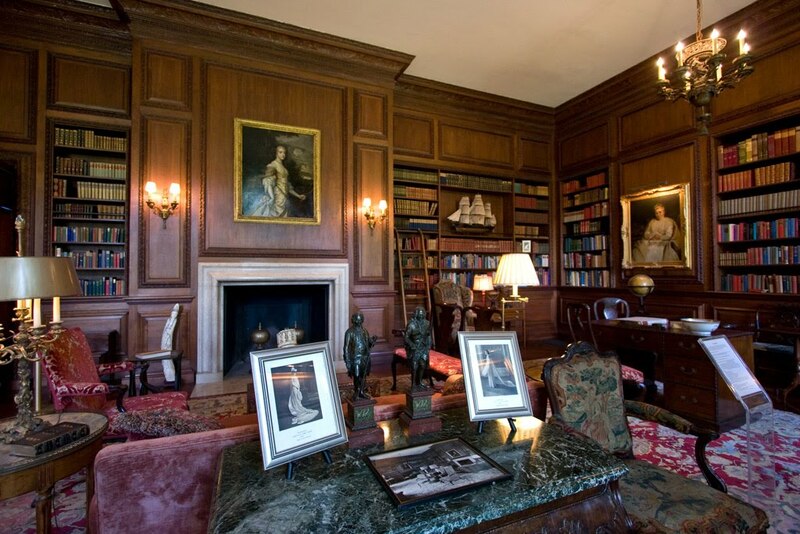 You might have guessed this is the Library with all the books and rich wood paneling. In the foreground is a few of the owners' family photos. Hung on the far right is a painting of the first owner's mum, Mrs. Bourn. The carpeting on the floor was from Queen Victoria's home on the Isle of Wight. The Dining Room is huge and I feel a little too formal a place to eat a meal. 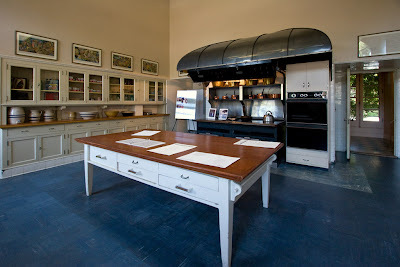 With a full-time cook living onsite, this is the Kitchen he used to cook the family meals. Wow! I hope someday I'll get to see it. The kitchen is my favorite room, always, the kitchen. Wow, that library is amazing. I cannot even imagine. My entire apartment could probably fit into one of their closets and then some. 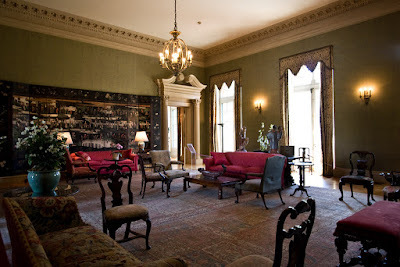 wow, very interesting interiors, would love to visit it too, and like you, love the ballroom too. You are one nice lady leaving a comment on my Bahia Honda blog. Your blog here is very nice. And the photos are excellent. Just great work. All the best. Whoa! Very, very beautiful inside. Love the grand ballroom and the kitchen. I think I'd get creeped out living in such a big house. I like a cozy small home. I love old decorated houses. I love that rug in the dining room. It's certainly a beautiful place but I can't imagine living like that. Thanks for sharing, very nice shots! Sue: If you're ever in Northern CA, it's a short drive from San Francisco and lovely in spring. 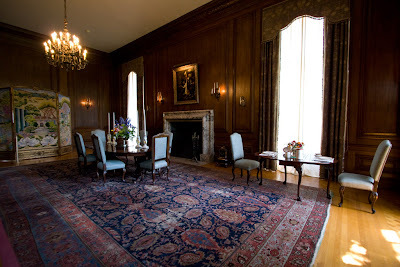 Poetic Shutterbug: The rooms are huge! I can't imagine doing the dusting and cleaning. Betchai: The ballroom is fancy and the murals are something else. Just a short drive from San Francisco if you ever decide to visit. Charles: Thanks for visiting too! RoseBelle: I like the kitchen too! The drawers on the center aisle can be opened on both sides. Quite ingenious. I know what you mean about the house being too big. Beth: Imagine the meals you can cook in that huge kitchen. Emm: Thank you so much! And thank you for that great review on Blogged! Dot: Lots of the furnishings & drapes are from the previous owners. Susanne49: Thank you! Very few people were fortunate enough to live like that. It probably costs 100x more to build a house like this now. What a really beautiful house! Thank you for visiting my old house and taking pictures Karen! They are awesome!